Following tragic news that Malaysia Airlines MH17 was shot down in Ukrainian airspace on Thursday morning, details of the incident continue to flood out. 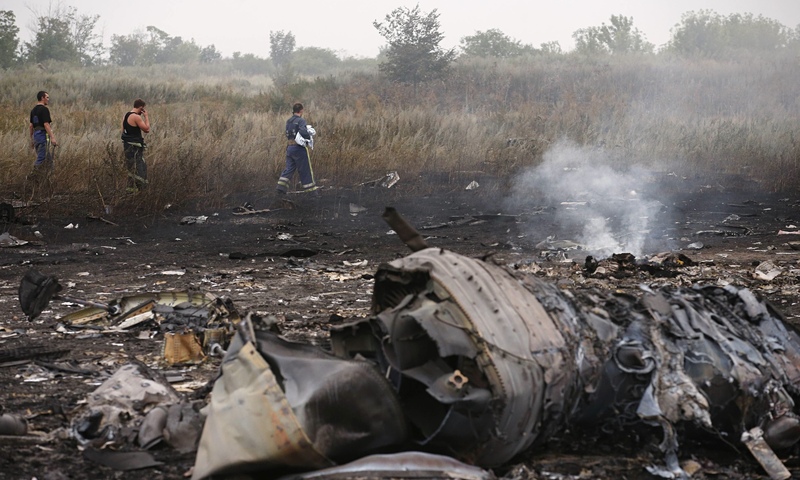 The Boeing 777 had 298 people aboard and went down near Torez, located in eastern Ukraine's Donetsk region. The airplane was traveling almost 33,000 feet and was at cruising altitude before being struck by a surface-to-air missile. It's still unknown what type of surface-to-air missile brought the craft down, but there are only limited options. It seems likely that the powerful Buk missile is responsible; a missile that is 16 feet long and weighs about 1,500 pounds, equipped with a 154-pound warhead - and includes a maximum speed of 2,684 mph. Even if it was fired towards MH17 from a distance of 30 miles, it still would make impact within just 40 seconds, military experts note. Almost 200 bodies have been recovered, but the crash scene is so large, it's unknown how long it will take to recover the remaining victims. U.S. military officials said a surface-to-air missile system turned on and tracked an aircraft before the MH 17 was hit. United States experts are studying possible missile trajectory patterns to see where it originated from, because of the confusion and finger pointing that is currently happening. It seems unlikely the Ukrainian government would have been unable to launch a surface-to-air missile inside of rebel-controlled territory - and the missile and missile launcher likely originated from Russia. Meanwhile, security analysts identified several phone calls allegedly made by Ukrainian rebels and their Russian backers regarding the missile launch. Ukrainian government officials are blaming pro-Russian Ukrainian militants, while the Russian government has been cautious not to say who actually fired the missile. Also worth noting, local media reports indicate Ukrainian rebels have launched Buk missiles at military aircraft and helicopters over the past week. "This tragedy would not have happened, if there had been peace on that land, or in any case, if military operations in southeastern Ukraine had not been renewed," said Russian President Vladimir Putin. And without a doubt the government of the territory on which it happened bears responsibility for this frightening tragedy." Local residents that witnessed the explosion and subsequent carnage reported seeing pieces of the aircraft, bodies, and debris hitting the ground over a few miles of farmland. Since the crash occurred in rebel-held area, tampering with debris has been reported - and one black box has been recovered by rebels. They reportedly said it will be turned over to Russian authorities, while emergency responders and authorities have been denied access to the crash site. A second black box was reportedly recovered by rescue workers, as Ukrainian rebels promised safe access will be provided to authorities. A number of the passengers were en route to the 20th International Aides Conference in Melbourne, Australia, including Joep Lange, a leading AIDS researcher. The aircraft took off from Amsterdam Airport Schiphol and was flying towards Kuala Lumpur International Airport when it went down by the Ukrainian-Russian border. This is the second tragic incident involving Malaysia Airlines in the past six months, following flight MH370 mysteriously disappearing from radar over the South China Sea after taking off from Kuala Lumpur International Airport. Flight wreckage hasn't been found and it's unknown how Malaysia Airlines, which has had financial issues dating back to 2005, will continue on in the future.